This collection of twelve pieces, one for each month, came about because of a commission from N. M. Bernard, editor of the St Petersburg music magazine, Nuvellist. Each month during 1876, Tchaikovsky wrote a short piano piece portraying subjects and activities typical of that month, and it was published in that month’s edition of Nuvellis. The result is this lovely collection of character pieces. “Troika”, written for the month of November, stands on its own. It is bright and bouncy, like riding in a troika being drawn by fast horses. It was a favorite encore of Sergei Rachmaninoff. “Barcarolle“, written for June, is so pretty that it has been arranged for flute, violin, viola, string bass, and orchestra. Written on an intermediate to advanced level, this entire work is considered standard literature for today’s pianists. 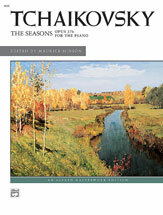 For more information about this collection of sheet music or other collections of piano music, please contact us at 1-800-42-MUSIC, email us at keyboard@stantons.com, or visit our website at http://www.stantons.com. Shop Stanton’s for all your sheet music needs.